U.S. President-elect Donald Trump is a “clever man” who is “already a statesman” and Russia is “ready to cooperate” with his incoming administration, Russian President Vladimir Putin said on Dec. 4. 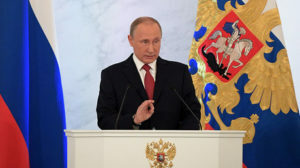 President Vladimir Putin delivers his annual address to the Federal Assembly on Dec. 1. “Because he achieved success in business, it suggests that he is a clever man. And if he is a clever man, then he will fully and quite quickly understand another level of responsibility. We assume that he will be acting from these positions,” Putin said in an interview with state-controlled NTV. “I think when he calls me brilliant I’ll take the compliment, ok?” Trump said.